* Senior club appearances and goals counted for the domestic league only and correct as of 16:42, 24 November 2016 (UTC). Fernando José Torres Sanz (Spanish pronunciation: [ferˈnando ˈtores]; born 20 March 1984) is a Spanish professional footballer who plays as a striker for La Liga club Atlético Madrid. Born in Fuenlabrada, Community of Madrid, Torres became interested in football as a child and joined his first team, Parque 84, at the age of five. His father José Torres worked during Torres' childhood, and his mother Flori Sanz travelled daily with him to training sessions. His grandfather was not a passionate football fan, but took pride in being an Atlético Madrid supporter, and Torres inherited his love for the club. Torres joined Serie A club Milan on a two-year loan on 31 August 2014. On his arrival he expressed a desire to emulate some of the club's greatest strikers, stating he wanted, "My shirt to rank alongside [Marco] van Basten, [George] Weah and [Filippo] Inzaghi." He debuted on 20 September 2014, replacing Andrea Poli for the last 14 minutes of a 1–0 home defeat against Juventus and scored his first Milan goal with a looping header in their 2–2 draw with Empoli two days later. On 27 December 2014, it was announced that Torres' move to Milan would be made permanent on 5 January 2015, but two days later he agreed to rejoin La Liga club Atlético Madrid on loan until the end of the 2015–16 season. The loan was agreed after Alessio Cerci went the opposite way from Atlético to Milan on the same day (5 January 2015). Torres' unveiling at the Vicente Calderón Stadium on 4 January 2015 drew a crowd of 45,000. He played the first match of his second spell on 7 January 2015, starting in the first leg of a Copa del Rey last 16 tie against Real Madrid. He had no shots on target and was replaced by Koke after 59 minutes, but Atlético won 2–0. Eight days later in the second leg, he scored two goals—in the first minute of each half—as Atlético advanced, his first goals in an away Madrid derby. Torres scored in the first minute again in the quarter-finals, albeit in a 2–3 home defeat against Barcelona. After the departure of Mario Mandžukić, Torres changed his shirt number from 19 back to his usual 9, which he wore during the remainder of the 2015–16 season. On 6 February 2016, Torres scored his 100th goal with Atlético Madrid in a 3–1 home league victory against SD Eibar on his 295th appearance for the club. The following month he marked the occasion of his 300th appearance for Atlético Madrid by scoring in a 3–1 victory over Valencia. On 5 April 2016, Torres scored the opening goal of Atlético's UEFA Champions League quarter-final with FC Barcelona at Camp Nou, before being sent off ten minutes later in an eventual 2–1 loss. 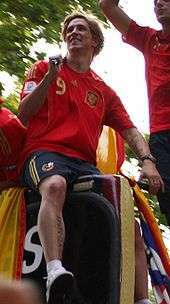 Torres was selected in Del Bosque's UEFA Euro 2012 squad. In his first start of the tournament he netted two goals as Spain defeated the Republic of Ireland 4–0 to knock them out of the tournament. In the UEFA Euro 2012 Final, Torres came on as a substitute against Italy, scoring one goal and assisting another, as Spain won a second consecutive European Championship with a 4–0 victory. This secured him the Golden Boot for the tournament with three goals and one assist, having played fewer minutes than Mario Gómez, who also had three goals and one assist. Torres' parents are José Torres and Flori Sanz. He has two older siblings, Israel (born 1977) and María Paz (born 1976). He married Olalla Domínguez Liste on 27 May 2009 in a private ceremony with just two witnesses at the local town hall in El Escorial, Madrid. They had been a couple since 2001 and are thought to have met in the Galician seaside town of Estorde, Cee, where Torres would go on family holidays each year to escape the Spanish capital. The couple have two children, a daughter, Nora, born on 8 July 2009 at the Hospital La Rosaleda, in Santiago de Compostela, Galicia, and a son, Leo, born on 6 December 2010 at Liverpool Women's Hospital, with Torres missing the fixture against Aston Villa at Anfield. 1 2 "FIFA World Cup South Africa 2010: List of Players" (PDF). FIFA. 4 June 2010. p. 29. Retrieved 20 April 2014. ↑ "Fernando Torres". Chelsea F.C. Archived from the original on 22 August 2014. Retrieved 5 August 2014. ↑ "Fernando Torres condecorado con la Medalla 'Ciudad de Fuenlabrada'" (in Spanish). SER Madrid Sur. 6 February 2009. Retrieved 13 March 2010. 1 2 3 "Infancia" (in Spanish). Fernando Torres. Retrieved 20 June 2010. ↑ Samuel, Martin (19 January 2009). "Fernando Torres talks to Martin Samuel: Liverpool's Spain superstar on Kaka, feeling at home and the battle to stop Manchester United's title chase". Daily Mail. London. Retrieved 8 February 2009. ↑ "Torres asegura que habría sido "un gran portero"". Marca (in Spanish). Madrid. 17 April 2008. Retrieved 18 May 2011. ↑ "Japanese comic superhero drawn to Tokyo Olympic bid". Agence France-Presse. 11 August 2009. Retrieved 20 June 2010. 1 2 3 4 5 6 "Atlético de Madrid" (in Spanish). Fernando Torres. Retrieved 17 November 2008. 1 2 3 4 5 Lowe, Sid (4 July 2007). "Will Torres be Kop's new God or just another Fernando?". The Guardian. London. Retrieved 5 August 2014. 1 2 3 4 5 "Primer equipo" (in Spanish). Fernando Torres. Retrieved 17 November 2008. 1 2 3 4 5 6 7 8 9 10 11 12 13 "Torres". FootballDatabase. Archived from the original on 15 February 2009. Retrieved 8 June 2008. ↑ "Chelsea sign Bridge". The Daily Telegraph. London. 21 July 2003. Retrieved 30 January 2013. ↑ "Statistics: top scorers: 2003/2004". ESPN FC. Retrieved 5 August 2014. 1 2 3 "UEFA Intertoto Cup 2004". Rec.Sport.Soccer Statistics Foundation. Retrieved 9 June 2008. ↑ "Atletico warn Chelsea off Torres". BBC Sport. 28 June 2005. Retrieved 18 May 2011. ↑ "Atletico prepared to sell Torres". BBC Sport. 24 January 2006. Retrieved 18 May 2011. ↑ "Newcastle want me, claims Torres". BBC Sport. 16 March 2006. Retrieved 27 July 2011. ↑ Adams, Tom (6 February 2007). "'Flattered' Villa to stay with Che". Sky Sports. Retrieved 5 August 2014. ↑ Prentice, David (20 June 2007). "Torres is Reds' number one target". Liverpool Echo. Archived from the original on 3 June 2013. Retrieved 30 June 2007. ↑ "No Reds offer for Torres". The Daily Star. Dhaka. 27 June 2007. Archived from the original on 24 October 2012. Retrieved 20 June 2010. ↑ Kay, Oliver (28 June 2007). "Garcia the key as Liverpool step up pursuit of Torres". The Times. London. Retrieved 20 June 2010. 1 2 "Liverpool complete Torres signing". BBC Sport. 4 July 2007. Retrieved 18 May 2011. ↑ Carrick, Charles (30 June 2007). "Torres' £27m Liverpool deal". The Daily Telegraph. London. Retrieved 18 May 2011. 1 2 "Liverpool wrap up record Torres transfer". The Guardian. London. 4 July 2007. Retrieved 5 August 2014. ↑ Balague, Guillem (31 March 2008). "Rafael Benitez opens up on transfers, treachery, Torres, titles – and, of course, tinkering". The Times. London. Retrieved 20 June 2010. ↑ Sinnott, John (11 August 2007). "Aston Villa 1–2 Liverpool". BBC Sport. Retrieved 18 May 2011. ↑ Sanghera, Mandeep (15 August 2007). "Toulouse 0–1 Liverpool". BBC Sport. Retrieved 18 May 2011. ↑ Chowdhury, Saj (19 August 2007). "Liverpool 1–1 Chelsea". BBC Sport. Retrieved 18 May 2011. ↑ McKenzie, Andrew (25 September 2007). "Reading 2–4 Liverpool". BBC Sport. Retrieved 18 May 2011. ↑ Sinnott, John (28 November 2011). "Liverpool 4–1 FC Porto". BBC Sport. Retrieved 18 May 2011. ↑ "Moyes & Torres win monthly awards". BBC Sport. 7 March 2008. Retrieved 18 May 2011. 1 2 3 4 5 "Games played by Fernando Torres in 2007/2008". Soccerbase. Centurycomm. Retrieved 18 June 2012. ↑ Barrett, Tony (6 March 2008). "Fernando Torres: My pride at Anfield hat-trick record". Liverpool Echo. Retrieved 5 August 2014. ↑ May, John (15 March 2008). "Liverpool 2–1 Reading". BBC Sport. Retrieved 18 May 2011. ↑ McKenzie, Andrew (8 April 2008). "Liverpool 4–2 Arsenal (agg 5–3)". BBC Sport. Retrieved 18 May 2011. ↑ "Goalscorers for the 2001–2002 season". LFChistory.net. Retrieved 18 May 2011. ↑ "Ronaldo tops PFA nominations list". BBC Sport. 11 April 2008. Retrieved 18 May 2011. 1 2 "Ronaldo named player of the year". BBC Sport. 27 April 2008. Retrieved 18 May 2011. ↑ "Ronaldo wins writers' award again". BBC Sport. 2 May 2008. Retrieved 18 May 2011. ↑ "Torres equals Hunt record". Football.co.uk. 5 May 2008. Archived from the original on 10 August 2014. Retrieved 5 August 2014. ↑ Caroe, Charlie (6 May 2008). "Jose Reina: Fernando Torres will improve". The Daily Telegraph. London. Retrieved 18 May 2011. ↑ "Statistics: top scorers: 2007/2008". ESPN FC. Retrieved 5 August 2014. ↑ Caroe, Charlie (26 May 2008). "Chelsea target Liverpool's Spanish striker Fernando Torres with £50 million bid". The Daily Telegraph. London. Retrieved 18 May 2011. ↑ "Torres pledges long-term future to Reds". ESPN FC. 31 May 2008. Retrieved 5 August 2014. ↑ "Hicks laughs off Torres sale talk". BBC Sport. 17 June 2008. Retrieved 27 May 2011. ↑ Stevenson, Jonathan (16 August 2008). "Sunderland 0–1 Liverpool". BBC Sport. Retrieved 18 May 2011. ↑ Eaton, Paul (1 September 2008). "Reds confirm Torres injury". Liverpool F.C. Archived from the original on 3 April 2015. ↑ Sanghera, Mandeep (16 September 2008). "Marseille 1–2 Liverpool". BBC Sport. Retrieved 18 May 2011. ↑ McNulty, Phil (27 September 2008). "Everton 0–2 Liverpool". BBC Sport. Retrieved 18 May 2011. ↑ Sanghera, Mandeep (5 October 2008). "Man City 2–3 Liverpool". BBC Sport. Retrieved 18 May 2011. ↑ Custis, Neil (5 October 2008). "Man City 2 Liverpool 3". The Sun. London. Retrieved 20 June 2012. ↑ "Torres ruled out for '10–15 days'". BBC Sport. 16 October 2008. Retrieved 27 July 2011. ↑ McNulty, Phil (22 October 2008). "Atletico Madrid 1–1 Liverpool". BBC Sport. Retrieved 18 May 2011. ↑ Ogden, Mark (21 October 2008). "Fernando Torres puts Chelsea-Liverpool clash ahead of Atletico Madrid return". The Daily Telegraph. London. Retrieved 21 January 2011. ↑ "Ronaldo voted FIFPro World Player of the Year". UEFA. 27 October 2008. Retrieved 18 May 2011. ↑ Hughes, Ian (8 November 2008). "Liverpool 3–0 West Brom". BBC Sport. Retrieved 18 May 2011. ↑ "Torres open to Atletico return". Sky Sports. 9 November 2008. Retrieved 5 August 2014. ↑ "Striker Torres faces new lay-off". BBC Sport. 27 November 2008. Retrieved 27 July 2011. ↑ "Liverpool hit by Torres setback". BBC Sport. 4 December 2008. Retrieved 27 July 2011. ↑ "Ronaldo, Torres up for Fifa award". BBC Sport. 12 December 2008. Retrieved 18 May 2011. ↑ "Ronaldo collects Fifa world title". BBC Sport. 12 January 2009. Retrieved 12 January 2009. ↑ Ashenden, Mark (3 January 2009). "Preston 0–2 Liverpool". BBC Sport. Retrieved 18 May 2011. ↑ McNulty, Phil (1 February 2009). "Liverpool 2–0 Chelsea". BBC Sport. Retrieved 1 February 2009. ↑ Evans, Tony (13 February 2009). "The 50 greatest Liverpool players". The Times. London. Retrieved 22 February 2009. ↑ Brown, David (11 March 2009). "Fernando Torres used powers of persuasion to play against Real Madrid". The Times. London. Retrieved 13 April 2009. ↑ McNulty, Phil (10 March 2009). "Liverpool 4–0 Real Madrid (agg 5–0)". BBC Sport. Retrieved 18 May 2011. ↑ McNulty, Phil (14 March 2009). "Man Utd 1–4 Liverpool". BBC Sport. Retrieved 18 May 2011. ↑ "Giggs earns prestigious PFA award". BBC Sport. 26 April 2009. Retrieved 18 May 2011. ↑ Brett, Oliver (24 May 2009). "Liverpool 3–1 Tottenham". BBC Sport. Retrieved 25 May 2009. ↑ "Torres agrees new Liverpool deal". BBC Sport. 28 May 2009. Retrieved 27 July 2011. ↑ "Torres signs new Liverpool deal". BBC Sport. 14 August 2009. Retrieved 27 July 2011. ↑ "Torres signs contract extension with Liverpool". ESPN FC. 14 August 2009. Retrieved 5 August 2014. ↑ Ashenden, Mark (19 September 2009). "West Ham 2–3 Liverpool". BBC Sport. Retrieved 18 May 2011. ↑ Hunter, Andy (28 September 2009). "Priceless Fernando Torres slays Hull with a hat-trick show fit for a prince". The Guardian. London. Retrieved 5 August 2014. ↑ "Torres and Ferguson scoop awards". BBC Sport. 2 October 2009. Retrieved 18 May 2011. ↑ McNulty, Phil (25 October 2009). "Liverpool 2–0 Man Utd". BBC Sport. Retrieved 18 May 2011. ↑ "Benitez hails quality of Torres". BBC Sport. 26 October 2009. Retrieved 27 July 2011. ↑ Leach, Jimmy (22 December 2009). "FIFA/FIFPRO World XI announced". The Independent. London. Retrieved 31 August 2014. ↑ Ornstein, David (29 December 2009). "Aston Villa 0–1 Liverpool". BBC Sport. Retrieved 18 May 2011. ↑ "Rafa Benitez defends his decision to take off Torres". BBC Sport. 4 April 2010. Retrieved 27 July 2011. 1 2 3 "Games played by Fernando Torres in 2009/2010". Soccerbase. Centurycomm. Retrieved 18 June 2012. 1 2 "Liverpool's Fernando Torres out for rest of season". BBC Sport. 18 April 2010. Retrieved 27 July 2011. ↑ "Gerrard and Torres staying at Liverpool – Hodgson". BBC Sport. 16 July 2010. Retrieved 27 July 2011. ↑ "Hodgson expects Fernando Torres to stay at Liverpool". BBC Sport. 27 July 2010. Retrieved 27 July 2011. ↑ "Striker Fernando Torres committed to Liverpool". BBC Sport. 3 August 2010. Retrieved 27 July 2011. ↑ Sanghera, Mandeep (15 August 2010). "Liverpool 1–1 Arsenal". BBC Sport. Retrieved 18 May 2011. ↑ Sanghera, Mandeep (29 August 2010). "Liverpool 1–0 West Brom". BBC Sport. Retrieved 18 May 2011. ↑ "Torres landmark nets WBA win". Liverpool F.C. 29 August 2010. Archived from the original on 27 December 2014. ↑ Magowan, Alistair (24 October 2010). "Liverpool 2–1 Blackburn". BBC Sport. Retrieved 18 May 2011. ↑ Sanghera, Mandeep (22 January 2011). "Wolverhampton 0–3 Liverpool". BBC Sport. Retrieved 18 September 2011. ↑ Smith, Rory (27 January 2011). "Chelsea's £40 million bid for Liverpool striker Fernando Torres is an act of desperation". The Daily Telegraph. London. Retrieved 6 February 2011. ↑ Mondal, Subhankar (29 January 2011). "Quotes of the Week: 'Fernando Torres Tonight Submitted A Transfer Request', Wolfsburg Offer Volkswagens For Schulz And Adriano Galliani Is The New Moggi & More". Goal.com. Retrieved 6 February 2011. ↑ "Torres makes record move from Liverpool to Chelsea". BBC Sport. 31 January 2011. Retrieved 27 July 2011. ↑ McNulty, Phil (6 February 2011). "Chelsea 0–1 Liverpool". BBC Sport. Retrieved 18 May 2011. ↑ McNulty, Phil (23 April 2011). "Chelsea 3–0 West Ham". BBC Sport. Retrieved 24 April 2011. 1 2 3 "Games played by Fernando Torres in 2010/2011". Soccerbase. Centurycomm. Retrieved 18 June 2012. ↑ Magowan, Alistair (14 August 2011). "Stoke 0–0 Chelsea". BBC Sport. Retrieved 19 March 2012. ↑ McNulty, Phil (18 September 2011). "Man Utd 3–1 Chelsea". BBC Sport. Retrieved 19 March 2012. ↑ Williams, Aled (24 September 2011). "Chelsea 4–1 Swansea". BBC Sport. Retrieved 25 September 2011. ↑ Lemesre, Pascal (24 September 2011). "Fernando Torres handed red card after scoring". Sportsmole. Retrieved 24 September 2011. ↑ "Fernando Torres: Chelsea start has been 'very, very difficult'". The Guardian. London. 26 September 2011. Archived from the original on 6 December 2011. Retrieved 12 April 2013. ↑ Shemilt, Stephan (19 October 2011). "Chelsea 5–0 Genk". BBC Sport. Retrieved 19 March 2012. ↑ Chase, Graham (18 March 2012). "Chelsea 5–2 Leicester". BBC Sport. Retrieved 19 March 2012. 1 2 3 "Games played by Fernando Torres in 2011/2012". Soccerbase. Centurycomm. Retrieved 18 June 2012. ↑ Dawkes, Phil (24 April 2012). "Barcelona 2–2 Chelsea (agg 2–3)". BBC Sport. Retrieved 24 April 2012. ↑ Higginson, Marc (29 April 2012). "Chelsea 6–1 QPR". BBC Sport. Retrieved 29 April 2012. ↑ McNulty, Phil (19 May 2012). "Bayern Munich 1–1 Chelsea". BBC Sport. Retrieved 23 August 2012. ↑ Smith, Ben (12 August 2012). "Chelsea 2–3 Man City". BBC Sport. Retrieved 23 August 2012. ↑ Scrivener, Peter (19 August 2012). "Wigan 0–2 Chelsea". BBC Sport. Retrieved 23 August 2012. ↑ Sanghera, Mandeep (22 August 2012). "Chelsea 4–2 Reading". BBC Sport. Retrieved 23 August 2012. 1 2 3 4 5 6 7 "Games played by Fernando Torres in 2012/2013". Soccerbase. Centurycomm. Retrieved 13 August 2012. ↑ "English Premier League 2012–2013 : Table". Statto. Retrieved 11 April 2013. ↑ McNulty, Phil (28 October 2012). "Chelsea 2–3 Man Utd". BBC Sport. Retrieved 6 November 2012. ↑ "Chelsea 3–2 Shakhtar Donetsk". ESPN FC. 7 November 2012. Archived from the original on 26 February 2014. Retrieved 8 November 2012. ↑ Field, Dominic (21 November 2012). "Rafael Benítez appointed Chelsea interim manager until end of season". The Guardian. London. Retrieved 5 August 2014. ↑ Croydon, Emily (22 November 2012). "Can Rafael Benitez bring back the old Fernando Torres at Chelsea?". BBC Sport. Retrieved 15 March 2013. ↑ Palmer, Kevin (7 December 2012). "Torres: I need more time to perform". ESPN FC. Retrieved 5 August 2014. ↑ "Fernando Torres nets brace as Chelsea see off Sunderland in Premier League". Sky Sports. 8 December 2012. Retrieved 13 November 2015. 1 2 Barlow, Matt (5 April 2013). "Fernando Torres exclusive: Stick with me – Chelsea striker vows he'll never give up the fight to regain top form". Daily Mail. London. Retrieved 11 April 2013. 1 2 "Goal total clarification". Chelsea F.C. Archived from the original on 23 July 2013. Retrieved 25 May 2013. ↑ "Chelsea 2–0 Hull City". The Guardian. London. 18 August 2013. Retrieved 24 October 2013. 1 2 "Games played by Fernando Torres in 2013/2014". Soccerbase. Centurycomm. Retrieved 2 December 2015. ↑ "Chelsea and John Terry draw at Tottenham Hotspur but Torres sees red". The Guardian. London. 29 September 2013. Retrieved 24 October 2013. ↑ "Schalke fall to clinical Chelsea". UEFA. 22 October 2013. Retrieved 22 October 2013. ↑ "Champions League 2013/14: Fernando Torres hits brace in Chelsea victory over Schalke". The Sydney Morning Herald. 22 October 2013. Retrieved 13 November 2015. ↑ Winter, Henry (27 October 2013). "Chelsea 2 Manchester City 1: match report". The Daily Telegraph. London. Retrieved 27 October 2013. ↑ "Fernando Torres: AC Milan seal loan deal for Chelsea striker". BBC Sport. 31 August 2014. Retrieved 31 August 2014. ↑ "Milan 0-1 Juventus". BBC Sport. 20 September 2014. Retrieved 21 September 2014. ↑ "Empoli 2-2 Milan". BBC Sport. 23 September 2014. Retrieved 4 January 2015. ↑ "Fernando Torres: Atletico Madrid loan deal for AC Milan striker". BBC Sport. 29 December 2014. Retrieved 29 December 2014. ↑ "Official: Cerci joins AC Milan on loan". A.C. Milan. 5 January 2015. Retrieved 5 January 2015. ↑ "Fernando Torres: Atletico Madrid fans welcome striker on return". BBC Sport. 4 January 2015. Retrieved 4 January 2015. ↑ "Atl Madrid 2-0 Real Madrid". BBC Sport. 7 January 2015. Retrieved 7 January 2015. ↑ "Real Madrid 2-2 Atl Madrid". BBC Sport. 15 January 2015. Retrieved 15 January 2015. ↑ Reddy, Luke (28 January 2015). "Atl Madrid 2-3 Barcelona". BBC Sport. Retrieved 28 January 2015. ↑ "Atlético Madrid through after penalty pressure sinks Bayer Leverkusen". The Guardian. London. 18 March 2015. ↑ "Atl Madrid 2-0 Getafe". BBC Sport. 21 March 2015. ↑ Swaby, Sean (24 June 2015). "Fernando Torres Will Once Again Wear Atletico Madrid's Famed No. 9 Shirt". Bleacher Report. Retrieved 26 June 2015. ↑ "Torres scores his 100th goal with Atlético Madrid (Spanish)". Marca. Madrid. 6 February 2016. Retrieved 6 February 2016. ↑ "Torres marks 300th Atleti appearance in style". Marca. Madrid. 6 March 2016. Retrieved 8 March 2016. ↑ "Barcelona 2-1 Atlético". The Guardian. London. 5 April 2016. ↑ "Torres extends deal with Atlético Madrid". BBC Sport. 21 June 2016. ↑ "9. Fernando Torres". Liverpool Echo. Archived from the original on 13 October 2012. Retrieved 8 June 2008. ↑ Smith, Andrew (6 June 2010). "Andrew Smith: David Villa lacks the ego of his contemporaries". The Scotsman. Edinburgh. Retrieved 19 March 2012. ↑ "Fernando Torres". FIFA. Retrieved 13 November 2015. ↑ "Spain 4–0 Ukraine". BBC Sport. 14 June 2006. Retrieved 18 May 2011. ↑ "Spain – Tunisia". FIFA. Archived from the original on 17 October 2013. Retrieved 18 May 2011. ↑ "Top goals". FIFA. Archived from the original on 13 December 2013. Retrieved 11 June 2008. ↑ "Raul left out of Spain Euro squad". BBC Sport. 17 May 2008. Retrieved 18 May 2011. ↑ Ronay, Barney (10 June 2008). "Quicksilver Villa lights up the Alps". The Guardian. London. Retrieved 5 August 2014. 1 2 Taylor, Daniel (14 June 2008). "Torres plays up respect for Aragones". The Guardian. London. Retrieved 5 August 2014. ↑ Bevan, Chris (14 June 2008). "Sweden 1–2 Spain". BBC Sport. Retrieved 18 May 2011. ↑ McNulty, Phil (29 June 2008). "Germany 0–1 Spain". BBC Sport. Retrieved 18 May 2011. ↑ Rogers, Martin (29 June 2008). "Euro 2008: Man of the match, June 29". Yahoo! Sports. Archived from the original on 25 October 2012. Retrieved 18 May 2011. ↑ "Spain view". BBC Sport. 30 June 2008. Retrieved 18 May 2011. ↑ "Team of the Tournament" (PDF). UEFA. 30 June 2008. Retrieved 20 June 2010. ↑ "España vence a una digna Turquía en el partido 60 de Torres con la Selección absoluta (1–0)" (in Spanish). Fernando Torres. 28 March 2009. Retrieved 31 March 2009. ↑ "Spain unveils Confederations Cup roster". CBC Sports. 1 June 2009. Retrieved 5 August 2014. ↑ Scrivener, Peter (14 June 2009). "Spain 5–0 New Zealand". BBC Sport. Retrieved 18 May 2011. ↑ Mollina, R.; Campos, T. (14 June 2009). "Torres logra el 'hat trick' más rápido de la historia de la selección". Marca (in Spanish). Madrid. Retrieved 14 June 2009. ↑ Chowdhury, Saj (25 June 2009). "Spain 0–2 United States". BBC Sport. Retrieved 18 May 2011. 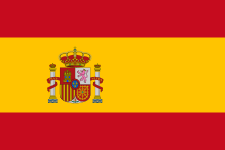 ↑ "Spain 3–2 South Africa (aet)". BBC Sport. 28 June 2009. Retrieved 18 May 2011. ↑ "Spain omit Marcos Senna from 2010 World Cup squad". BBC Sport. 20 May 2010. Retrieved 18 May 2011. ↑ "World Cup 2010 – Torres helps Spain rout Poland". Yahoo! UK & Ireland Eurosport. 8 June 2010. Retrieved 13 November 2015. ↑ Sheringham, Sam (16 June 2010). "Spain 0–1 Switzerland". BBC Sport. Retrieved 18 May 2011. ↑ "Del Bosque backs Torres". Sky Sports. 27 June 2010. Archived from the original on 22 October 2012. Retrieved 27 June 2010. ↑ Fletcher, Paul (11 July 2010). "Netherlands 0–1 Spain". BBC Sport. Retrieved 18 May 2011. ↑ "Euro 2012: Spain name Fernando Torres in 23-man squad". BBC Sport. 27 May 2012. Retrieved 11 April 2013. ↑ Chase, Graham (14 June 2012). "Spain 4–0 R. of Ireland". BBC Sport. Retrieved 15 June 2012. ↑ McNulty, Phil (1 July 2012). "Spain 4–0 Italy". BBC Sport. Retrieved 11 July 2012. ↑ "Euro 2012: Spain striker Fernando Torres wins Golden Boot award". BBC Sport. 2 July 2012. Retrieved 11 July 2012. ↑ "Spain make light work of Saudi Arabia". FIFA. 7 September 2012. Archived from the original on 9 July 2014. ↑ "Spain 10 – 0 Tahiti". Yahoo! UK & Ireland Eurosport. 20 June 2013. Retrieved 20 August 2013. ↑ Rodgers, Zach (20 June 2013). "Spain tallies 10 in historic win; Forlán secures Uruguay victory". ESPN FC. Retrieved 5 August 2014. ↑ Peck, Brooks (1 July 2013). "Fernando Torres wins another Golden Boot award, is understandably less than excited about it". Yahoo! Sports. Retrieved 2 August 2014. ↑ "Spain 2–0 Bolivia". BBC Sport. 30 May 2014. Retrieved 31 May 2014. ↑ "World Cup 2014: Spain drop Alvaro Negredo and Jesus Navas". BBC Sport. 31 May 2014. Retrieved 31 May 2014. ↑ Ornstein, David (13 June 2014). "Spain 1–5 Netherlands". BBC Sport. Retrieved 2 August 2014. ↑ Ornstein, David (18 June 2014). "Spain 0–2 Chile". BBC Sport. Retrieved 2 August 2014. 1 2 Chowdhury, Saj (23 June 2014). "Australia 0–3 Spain". BBC Sport. Retrieved 24 June 2014. ↑ "Profile". ESPN FC. Archived from the original on 4 January 2014. ↑ Wyman, Ed (6 December 2010). "The 25 Best Premier League Speedsters: Ashley Cole, Fernando Torres, Gareth Bale and More: Fernando Torres". Bleacher Report. Retrieved 13 November 2015. ↑ "Football is a funny ol game". The Sun. London. 15 April 2008. Retrieved 13 January 2009. ↑ Galaz, Mábel (28 May 2009). "Se casa Fernando Torres". El País (in Spanish). Madrid. Retrieved 19 March 2012. ↑ "Fernando Torres welcomes baby 'Leo' after dodging Liverpool match at wife Olalla's bedside". Daily Mail. London. 7 December 2010. Retrieved 19 December 2010. ↑ "Liverpool star Fernando Torres becomes a dad". Daily Mirror. London. 10 July 2009. Archived from the original on 13 May 2013. Retrieved 18 May 2011. ↑ "Fernando Torres welcomes baby Leo as Liverpool striker's wife Olalla gives birth". football.co.uk. 7 December 2010. Retrieved 13 November 2015. ↑ "Balls to the Crunch". FourFourTwo: 50. February 2009. ↑ "Dani Martín" (in Spanish). Fernando Torres. 30 September 2005. Retrieved 20 June 2010. ↑ "Full cast and crew for Torrente 3: El protector". Internet Movie Database. Retrieved 20 June 2010. ↑ Wilson, Simon (22 October 2009). "El Nino: My Story". ESPN FC. Retrieved 13 November 2015. ↑ "Famous Tolkien and Lord of the Ring fans". Tolkien Library. Retrieved 4 July 2013. ↑ "Fernando Torres: Fernando José Torres Sanz: 2000–01". BDFutbol. Retrieved 4 June 2014. ↑ "Fernando Torres: Fernando José Torres Sanz: 2001–02". BDFutbol. Retrieved 4 June 2014. ↑ "Fernando Torres: Fernando José Torres Sanz: 2002–03". BDFutbol. Retrieved 4 June 2014. ↑ "Fernando Torres: Fernando José Torres Sanz: 2003–04". BDFutbol. Retrieved 4 June 2014. ↑ "Fernando Torres: Fernando José Torres Sanz: 2004–05". BDFutbol. Retrieved 4 June 2014. ↑ "Fernando Torres: Fernando José Torres Sanz: 2005–06". BDFutbol. Retrieved 4 June 2014. ↑ "Fernando Torres: Fernando José Torres Sanz: 2006–07". BDFutbol. Retrieved 4 June 2014. ↑ "Games played by Fernando Torres in 2008/2009". Soccerbase. Centurycomm. Retrieved 18 June 2012. ↑ "Games played by Fernando Torres in 2014/2015". Soccerbase. Centurycomm. Retrieved 2 December 2015. 1 2 3 4 "F. Torres". Soccerway. Perform Group. Retrieved 24 November 2016. ↑ "Torres, Fernando". National Football Teams. Retrieved 2 January 2016. 1 2 3 4 5 6 7 8 9 10 11 12 13 "Palmarés" (in Spanish). Fernando Torres. Retrieved 17 November 2008. ↑ "Torres seals Spanish triumph". UEFA.com. Retrieved 5 June 2016. 1 2 3 "Fernando Torres". UEFA.com. 5 June 2013. Retrieved 5 June 2016. ↑ "Torres sparkles for Spain". UEFA.com. Union of European Football Associations. Retrieved 5 June 2016. ↑ "Tracking Fernando Torres' career since he left Atletico Madrid". Goal.com. 31 August 2012. Retrieved 5 June 2016. ↑ "Moyes & Torres win monthly awards". BBC Sport. BBC. 7 March 2008. Retrieved 5 June 2016. ↑ "Torres and Ferguson scoop awards". BBC Sport. BBC. 2 October 2009. Retrieved 5 June 2016. ↑ "Goal of the month, April 2009". BBC Sport. 9 June 2009. Retrieved 17 October 2012. ↑ "Hero Torres completes honours list". UEFA.com. 30 June 2008. Retrieved 8 June 2016. ↑ "THE PLAYERS". FIFPro World Players' Union. Retrieved 5 June 2016. ↑ "Special ESM Squads". European Football Statistics. Retrieved 5 June 2016. ↑ "FIFA World Player of the Year - Women's votes by player" (PDF). FIFA.com. Fédération Internationale de Football Association. 12 January 2009. Retrieved 5 June 2016. ↑ Pierrend, José Luis (16 January 2009). "European Footballer of the Year ("Ballon d'Or") 2008". RSSSF. Retrieved 5 June 2016. ↑ "FIFA Confederations Cup South Africa 2009 – Awards". FIFA.com. Retrieved 5 June 2016. ↑ "Fernando Torres receives the MARCA Leyenda". MARCA. 6 February 2012. Retrieved 5 June 2016. ↑ "FIFA Confederations Cup Brazil 2013 – Awards". FIFA.com. Retrieved 5 June 2016. ↑ Bruña, Manel (10 May 2011). "Las campeones del mundo de fútbol ya tienen la Real Orden del Mérito Deportivo". El Mundo Deportivo (in Spanish). Barcelona. Retrieved 5 March 2013.